While charging you phone with a power bank, you may have often wondered – what if I could also charge devices that need AC wall socket also with my power bank. The good news is that many such power banks with an AC wall outlet – in addition to USB charging – are available in the market. You can use these power banks featuring portable wall outlets to charge ANY of your electrical devices that draw up to 100 watts of power! The catch here is that portable powerbanks, which only have an AC port, have very high weight-to-battery ratio due to low efficiency and are NOT the best option for laptops. Small AC powerbanks are only suited for specialized professional equipment as well as equipment such as CPAP machines that do not have a DC input option. For laptops/Macbooks or any other equipment with DC input option, your best bet is to choose powerbanks with high-voltage DC barrel port output or with dual HVDC+AC ports or USB-C PD powerbanks. The high expense on an AC Power outlet powerbank is worth it for professionals or individuals who may need that few additional hours on the their electronic/camera equipment to finish that vital project or assignment in the field. There are a number of manufacturers offering AC powerbanks with the market exploding in the last 3 years. For this article, we will focus on the one that began offering portable power outlets in an extremely small form factor, making it possible to carry around such power banks with you. This is the Chargetech’s Chargeall series. the ChargeAll series power banks with AC outlets, as well as USB outlets, are available in battery capacities of 27,000 mAh. Review Summary: Latest version compares well with competition such as the RAVPower Universal Powerbank 27000 or but the price is way too much! We recommend RAVPower Universal Powerbank 27000 if you need portable AC power outlet (<100 watt) and Poweradd Pilot Pro2 23000 if you just need a powerbank for laptop, CPAP, and smartphone and do not need an AC outlet. With highly-efficient direct DC output, Poweradd Pilot Pro2 23000 delivers charging for all major laptop brands (+ smartphones) at same (or better) effective battery backup capacity as RAVPower Universal Powerbank 27000 but costs almost half!! Light for a 110/220 Volt AC outlet in your pocket (1.56lb or 750 gms)! 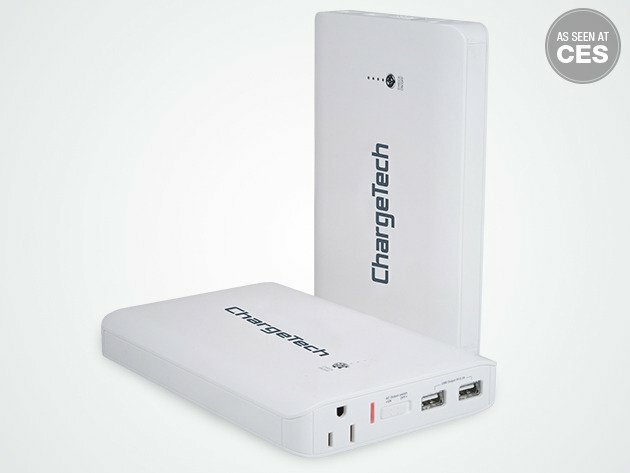 What Can ChargeAll Power Banks Charge? One 110 Volt AC wall plug outlet for charging any electrical device drawing up to 85 watts of power such as most light laptops such as Macbook Air, Microsoft Surface series laptops, Chromebooks etc. Chargeall series power banks are currently available in 27,000 mAh battery capacity. Earlier, 12,000 mAh and 18,000 mAh versions were also available, but they have been discontinued as of now. 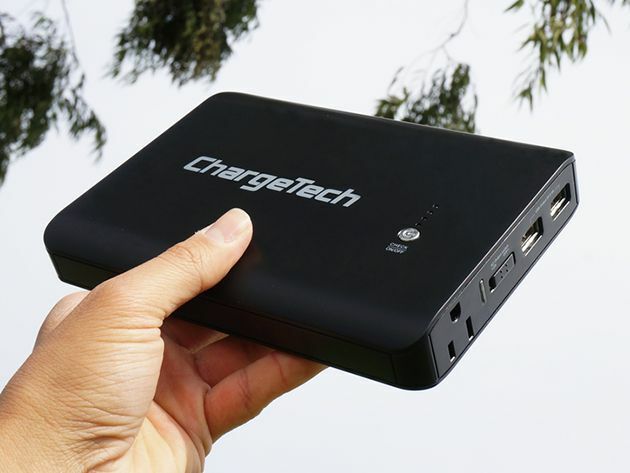 We believe that Chargetech 27,000 mAH offers excellent portable power solution for a wide variety of outdoor and emergency power needs…if you can afford it. 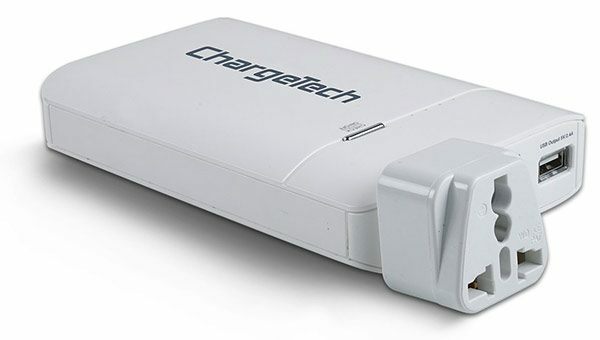 Having both USB charging ports and AC outlet in your power bank gives you incredible flexibility and options on business travel as you can extend the range of your workhorse laptop and your smartphone with a handy and lightweight device. Such flexibility is also incredibly useful for emergency and outdoor purpose when sometimes you may have to operate a regular AC light or even a small fan for some time. Well, all this flexibility and charging power comes at a somewhat steep cost when compared to other power banks with AC outlet such as the equivalent RAVPower Universal Powerbank 27000 . ChargeAll power banks cost much higher than most other competitors. ChargeAll series power banks originated from an crowdfunding project on Indiegogo in 2015. Since then, after some initial hiccups, the product quality has become reliable and dependable with high reviews and product ratings on Amazon. We found ChargeAll series 27,000 mAH battery bank to be an excellent and dependable performer in charging our test Macbook Air 2015, boosting its operating time by 7-10 hours at a time on an average ! RAVPower Universal Powerbank 27000 is direct competitor to ChargeAll 27000 and also our top pick as portable AC outlet or laptop powerbank. RAVPower Universal Powerbank 27000 is a superior product that beats Chargeall 27000 when it comes to portability, versatility and build-quality. RAVPower Universal Powerbank 27000 offers 100W power output allowing you to run more heavy loads and AC equipment while Chargeall offers up to 85 W.
RAVPower Universal comes with USB-type C port allowing you to charge latest phones such as Samsung Galaxy S8, Nintendo Switch, the latest Macbooks and laptops directly using the powerbank. This also offers much higher charging efficiency compared to charging your Macbook through AC power.